Our oceans are in trouble. Climate change, plastic waste and overfishing are all causing tremendous damage to underwater life around the world. Inspired by the BBC's Blue Planet II series, developer E-Line Media is making a video game that focuses on the scientists who are trying to understand our impact. It's called Beyond Blue and will put you in charge of a research team with stunning technology designed to unlock new insights about the sea. Your task is simply to gather information and learn what you can about these fast-changing, human-made threats to the sea. You can take the main character, Mirai, to the ocean floor and grab new research first hand. Or you can deploy a series of drones that can work on your behalf or be piloted from a first-person perspective. Where you decide to go, and the leads you choose to pursue, are entirely up to you. The investigation has a time limit, however, so you'll need to carefully manage the tools at your disposal. Better marine microphones, for instance, could help you triangulate the position and speed of certain animals. Developing your drones, meanwhile, could result in more accurate and interesting sightings. E-Line Media describes it as a narrative-driven exploration game. 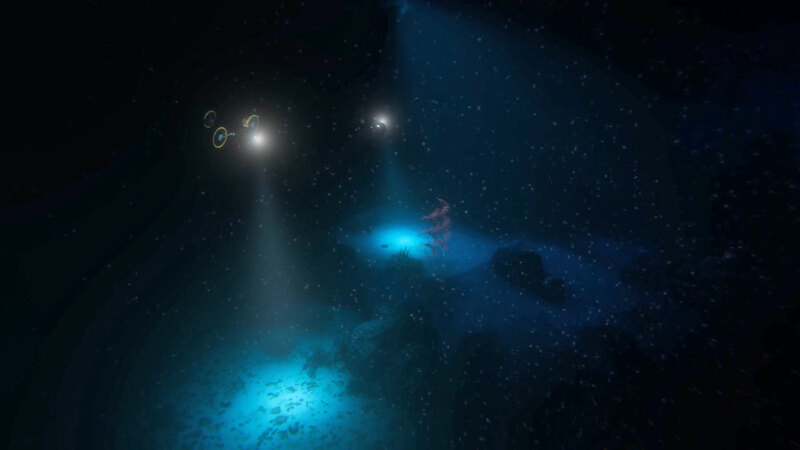 The focus, though, is on replicating a real-life research project, rather than a fantastical journey like Abzu. Some of the technology is, admittedly, beyond humanity's reach right now, but the team says it's all based on hardware that is being developed or discussed right now. Mirai, for instance, has a suit that can visualize useful information through AR. The drones will use a fictional machine learning algorithm to improve their image recognition and, therefore, creature detection abilities. The team has fine-tuned its vision through discussions with the BBC and working researchers. "We started asking each scientist how they would use their time below if they could jump forward ten or fifteen years and lead a small team powered with a full fleet of advanced technology," Michael Angst, CEO of E-Line Media said. "We found their answers fascinating and the game has emerged as a way to channel these visions into what we hope will be an atmospheric and moving experience." E-Line Media is best known for Never Alone, an illustrated puzzle-adventure game developed in partnership with an Alaskan Native community. The title included short videos, called cultural insights, that explained what it's like to live in such a harsh environment. Beyond Blue will offer a similar mixture of education and entertainment. This time, E-Line Media will be using videos taken from Blue Planet II, including previously unreleased footage. These will also include interviews with ocean researchers who are inching closer to the near-future vision portrayed inside the game. Educational video games are often well-intentioned but fall embarrassingly short of the quality expected by players. That is starting to change, though, with games like Valiant Hearts and the Discovery Tour mode in Assassin's Creed Origins. E-Line Media is a 10-person team, so it'll never match the visual fidelity of a blockbuster studio. But it has plenty of experience in educational games — the company co-published MinecraftEdu before Mojang was bought by Microsoft. And it seems to be crafting titles that strike a better balance between genuine learning and robust, immersive gameplay. Beyond Blue will be out in early 2019 for a variety of consoles and PC.